Sun., Sept. 3, 2017, 7:32 p.m.
MONZA, Italy – Lewis Hamilton’s toughest test Sunday came when he was met with a chorus of whistles and boos atop the podium for the Italian Grand Prix. The throng of red-clad fans who invaded the track had come hoping to see a Ferrari victory as the automaker celebrated its 70th anniversary. Instead, Hamilton won virtually unchallenged from pole position, Mercedes teammate Valterri finished second, and Hamilton took the championship lead from Ferrari’s Sebastian Vettel, who placed third. “Some are more happy than others. … You might have to just punch through this,” former F1 driver Martin Bundle, who was handling the podium interviews, told Hamilton as the crowd made its feelings known loud and clear. 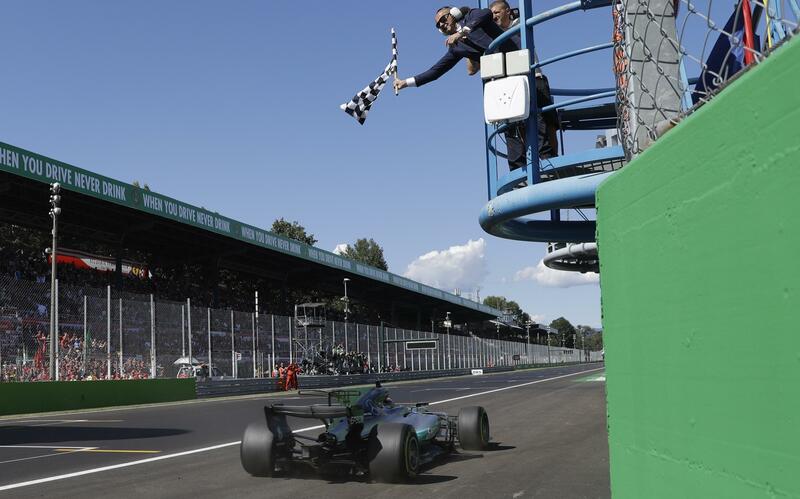 It was the perfect response to calm the crowd down and crown a perfect weekend for Hamilton, who on Saturday eclipsed former Ferrari great Michael Schumacher’s record for Formula One pole positions, with his 69th. Later, Hamilton went down into the crowd and was mobbed. Hamilton finished nearly five seconds ahead of Bottas while Vettel came third, more than half a minute behind. Hamilton now has 238 points, three more than Vettel with seven races remaining. “It’s obviously an incredibly exciting season and the last two races have been incredibly strong for us as a team,” said Hamilton, who faced more of a challenge from Vettel in Belgium last weekend. Vettel had led the standings all season but Ferrari struggled in rainy qualifying conditions Saturday and couldn’t match Mercedes’ race pace, either, on a Monza circuit featuring long straights and high speeds better suited to Mercedes’ outright power. After getting out of his car, Hamilton first greeted Bottas then jumped into a crowd of Mercedes team members. Vettel acknowledged that his result did not meet expectations. After a brilliant start to the season, Vettel has now won just one of the last seven races. He also trails Hamilton in wins, six to four. “We didn’t have the pace of Mercedes today,” Vettel said. Red Bull’s Daniel Ricciardo finished fourth, having climbed through the field from a 16th-place start due to a grid penalty. Kimi Raikkonen crossed fifth – exactly where he started – in the other Ferrari. Force India’s Esteban Ocon placed sixth and 18-year-old Lance Stroll settled for seventh after becoming the youngest F1 driver to start on the front row in his Williams. Felipe Massa, Sergio Perez and Max Verstappen rounded out the top 10. As drivers gathered at the front of the grid for the national anthem ahead of the race, air force jets flew low overhead emitting a trail of smoke in the green, white and red colors of the Italian flag. Hamilton got off to a clean start and Bottas quickly moved up from fourth to put Mercedes 1-2 after only four laps. Raikkonen battled with Bottas early on but then went off course and had to slalom through the barriers. “I have damage on the rear of the car,” Raikkonen said via team radio. But Ferrari told the Finn they couldn’t see anything. “I don’t know to fix it,” Raikkonen replied. Meanwhile, Vettel slipstreamed past Ocon down the main straight to move into third but he, too, then reported problems with the rear of his car and kept dropping further and further behind the Mercedes cars. Hamilton’s only hiccup came when he skidded onto the edge of the gravel briefly midway through the race. Otherwise, he and Bottas were gaining half a second per lap on the Ferraris. Published: Sept. 3, 2017, 7:32 p.m.